The information in this section is a summary of "A Case Study on the Formation of Umpqua Indian Utility Cooperative: A Tribal Utility Formed by the Cow Creek Band of Umpqua Tribe of Indians " by Wayne Shammel, General Counsel for the Tribe and Margaret M. Schaff, PC, Attorney for the Affiliated Tribes of Northwest Indians Economic Development Corporation, November 2002. A link to the original document is included at the end of this section. The goal in establishing the Umpqua Indian Utility Corporative (UIUC) was to create a cost savings in electricity for the Cow Creek Tribe. By taking responsibility for its own electrical infrastructure in this way, the Tribe could continue to minimize its costs, protect and exercise its sovereign status, and diversify its own and other local business interests. 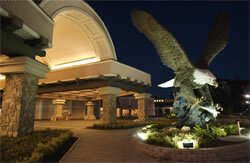 Seven Feathers Hotel & Casino Resort complex. 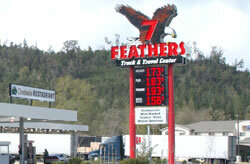 Seven Feathers Truck & Travel Center including the Creekside Restaurant. About eight other tribal utilities operate in the United States. Some were started and developed by the US Bureau of Indian Affairs and are now managed by tribal governments. Some were developed during a casino development project. Some were developed from the ground up to serve tribal members on reservations. Some are "virtual utilities" that do not own distribution facilities but serve administrative needs of existing distributors. UIUC acquired and owns existing utility distribution infrastructure. UIUC began operation with a new power supplier, BPA. Must be a not-for-profit cooperative (not-for-profit, investor owned). But at the time of formation of UIUC, the Cow Creeks were served by an investor owned "for profit" entity, not a BPA preference entity. Federal jurisdiction, governed by the Federal Energy Regulatory Commission. State jurisdiction, governed by the Oregon Public Utilities Commission. Tribal jurisdiction, governed by the Tribal Constitution and Tribal laws. Not reservation lands falling under inherent sovereign tribal authority. Not fee owned lands falling within any reservation. Entirely on tribal trust lands. The Tribe decided and the state of Oregon did not disagree, that any state laws regarding utility matters on Cow Creek Tribal trust lands that were in conflict with tribal law would infringe on the right of the Tribe to make laws and be ruled by them. Therefore, it was decided that besides the Federal government, the Cow Creek Tribe, not Oregon, was the only entity that had jurisdiction over utility activities on those lands that were entirely Cow Creek trust lands. It is of interest to note that to avoid the appearance of acquiescing to state authority, the Tribe did not solicit Oregon's opinion on this matter of jurisdiction. Also, to ensure business-like rather than confrontational transactions, the Tribe took precautions to ensure that the effect of its forming its own utility and removing its load from the state-governed base rate, would have a minimal impact on the existing service provider. All of BPA's long-term contracts were set to expire in 2001. Up until the late 1990s, BPA rates had been below market wholesale power rates and BPA was faced with the prospect of having higher than market costs. If that happened, BPA might lose its customer base and its ability to repay its public debt to the US Treasury. In 1998 and 1999 "Subscription" meetings were held to determine the terms and conditions under which BPA power would be sold and to encourage its customers to stick with BPA. During the subscription process, BPA established its rates for 2001 - 2006. They turned out to be below market value and, so, it turned out that BPA would have plenty of customers. All new customers could apply for 75 megawatts of new power at the lowest preference rate. Other customers needing over 75 megawatts would have to pay a higher rate. Were legally formed in accordance with Federal, state, tribal or local laws. Owned a distribution system and were ready, willing and able to take BPA power. Had a general utility responsibility within its service area. Had the financial ability to pay BPA for the power it purchased. Had adequate utility operations and structure. Were able to purchase power in wholesale amounts. Truck & Travel Center with the Creekside Restaurant. Other Tribal owned lands with non-Tribal facilities were eligible for service but were too far from the initial service area for feasible economic acquisition of those facilities for inclusion in UIUC's service area. Now (2006) Creekside Development Project has resulted in numerous other Tribal facilities requiring more loads and an expansion of the initial UIUC distribution load and system. To legally form, manage and operate the utility; and to set its rate setting structure within the Cow Creek Government. To acquire the existing distribution system. To create utility standards and a utility responsibility for its service area. To clarify sovereign immunity issues so BPA would have legal recourse against the Tribe for non payment. To clarify sovereign issues so UIUC would have legal authority to pursue claims against it. Could the Tribe successfully negotiate or require its existing serving utility to sell them the utility facilities on tribal lands? Would the existing utility company provide the intermediary transmission from the BPA facilities to UIUC? The process UIUC went through to acquire the utility facilities already existing on Cow Creek trust lands was a friendly, multi-step process. The existing utility had a policy of not selling its utility facilities. The existing utility recognized the Tribe's right to sovereignty. The Tribe recognized its responsibility to the customers and shareholders of the existing utility. Existing utility facilities on Tribal trust lands were recognized as being personal, not real property, and Tribal law established that fact. Tribal code established eminent domain of personal property on Tribal trust land. Standards for payment of just compensation under Tribal law for purchased land on trust property were entirely similar to Federal law standards. The Tribe used the cashing of the compensation check as a signal of the acceptance of the compensation offered. Immediately after acquiring the existing utility facilities, UIUC expanded its underground operation under Interstate 5 in order to serve the Seven Feathers Truck & Travel Center and Creekside Restaurant. The second unresolved issue, whether or not the existing utility would provide UIUC with BPA power, was settled under Federal law and policy. The UIUC system is a wholesale power provider in that it purchases power in bulk from BPA and delivers it to more than one load. Therefore, UIUC is entitled to the open access use of the Federal transmission system by BPA to serve their wholesale loads. That is, at inception, UIUC became eligible for the "wheeling" of Federal power to the wholesale customers of BPA. The Federal Energy Regulatory Commission requires wheeling of Federal power, BPA included, to wholesale customers. The existing utility really had no legal choice in the matter. Legally, it had to provide BPA power to UIUC. As described in more detail in the Case Study on the formation of UIUC, the Cow Creek Tribe passed through many hoops in the process of creating UIUC. These steps may be of interest to others contemplating similar courses of action. Through rigorous economic analysis, the Tribe was fairly certain it would accomplish its central cost savings goal. To avoid complications with the existing utility provider, the Tribe passed a resolution requiring continuation of service during the transition period. The Tribe acquired existing facilities on its trust lands with the tacit approval of the existing owner. Throughout the process, the BPA willingly assisted the Tribe in making sure it would meet its Standards of Service. Six months prior to the switch-over, the Tribe submitted a Letter of Intent to become a new customer to purchase preferential power from BPA. Letters of Intent are taken on a first-come-first-served basis. Soon after sending the Letter of Intent the Tribe (and one other tribal utility and one municipal utility) made the cut. Within three months of making the cut, the Tribe was required to sign a Contingent Sales Contract and a Transmission Contract. The Tribe then had to prove it satisfied the Standards of Service. Finally, the Tribe had to prove it had the financial ability to pay BPA for its power and that it was properly set up to operate as a legitimate utility system. At midnight on October 1, 2001, UIUC began service as the power utility for the Cow Creek Tribe. In the future, the Cow Creek Tribe will be in a position to play a more important advisory role in regional power making decisions. Indian tribes have sovereign rights on their lands that affect many energy decisions that, in turn, affect these sovereign rights. To avoid issues with tribal governments, those governments should be an up-front part of the energy generation, energy transmission and energy delivery decisions made by Federal and state authorities. In this way tribal cooperation and participation can result in more effective energy projects.